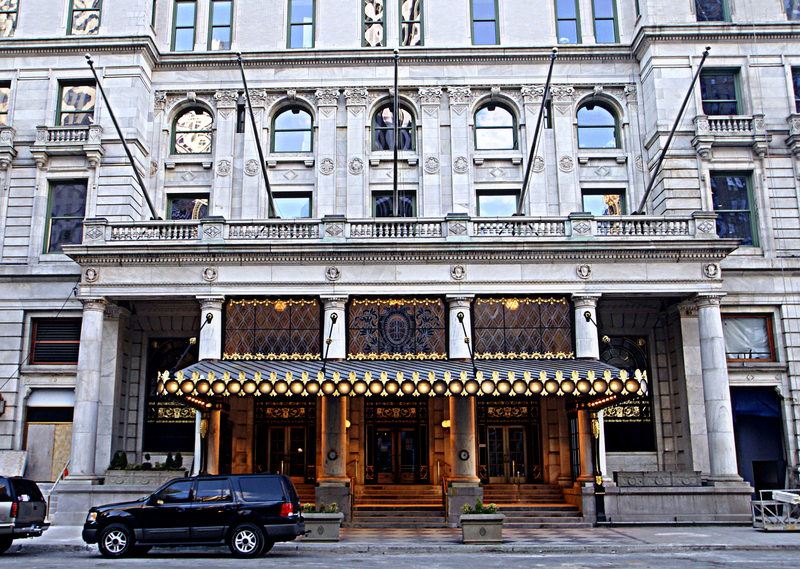 Everyone's favorite dowager hotel, the Plaza is the quintessence of Edwardian elegance and New York urbanity. Its sumptuous lobbies were lavishly and meticulously spruced up by Donald Trump's renovation, designed by Hardy Holzman Pfeiffer Assocs., and they retained their exuberant and unabashed splendor. Several years later, however, the hotel changed hands again and it was closed for a major renovation for more than two years. Highly polished and carved bronze fittings, luxurious carpets, gilded ceilings, marble walls and lush floral displays befit the lobby spaces nicely. The colors exude an exaggerated warmth that effectively coddles the visitor and guest even if they border on the rococo garish. The main entrance on Fifth Avenue, shown above, opens onto a square lobby that leads directly to the famous Palm Court, for decades devoid of palm trees and its enormous skylight, but still with some haughty caratydids. The square lobby once also included the entrance on the south side to the famed Persian Room nightclub and later a fashion store. Less confused now, it functions better simply as an introduction to the hotel. The Palm Court, despite its transformations over the years, remains a delightfully large and open space in which to drink and dine. Surrounded on three sides by promenades with windowed partitions and on the fourth by mirrors, the "court" is inviting even when not full of guests, or violinists, or mountains of pastries. The Central Park South entrance lobby, shown below, is formally attractive. Devotees of grandness and party-crashers are not disappointed here especially if they explore the various nooks and crannies that lead to various restaurants, bars and ballrooms. If they are, they can always jump into the Pulitzer Fountain, below, outside the Fifth Avenue entrance, or drink away their sorrows in the Oak Bar with its grand, but dark Everett Shinn murals that show the former Vanderbilt mansion that once occupied the site of Bergdorf Goodman south of the fountain. When the Savoy Plaza Hotel was demolished to make way for the General Motors Building across the avenue, Trader Vic's moved from the Savoy Plaza into the basement of the Plaza, adding its special blend of exotic intoxication to the famed hotel's attractions. Sadly, it closed in 1993 to be replaced by another restaurant, Gauguin, that lasted not too long. The windowless Oak Room, the dining room that is attached to the Oak Bar, is the city's most baronial and overpowering but its dark paneling and ornate vaulting conjure haunted castles more than chateau romance. The Edwardian Room is less imposing than the Oak Room largely because of its large windows overlooking Central Park and the Pulitzer Fountain. The highly ornate ballroom facilities are relatively small and accommodate major parties for a few hundred people. In the 1960's, the Plaza lost a bit of its appeal as the St. Regis Hotel, three blocks south on Fifth Avenue, became a favorite of the international "jet" set. But the Plaza has survived, while the St. Regis has had its ups and downs, because nothing works better than stunning park views, the best location and opulent surroundings. Architecturally, the Plaza is not a masterpiece, but it is authentically impressive, the city's best chateau that, like a fine wine, has aged well. If this dowager was a mid-block property on a sidestreet, it might not have garnered as much attention or respect. Of course, its glistening bronze lighting fixtures underneath the stained glass entrance and canopy, the Palm Court in the center lobby, and ornate elevator doors and brightly colored carpets in its Fifth Avenue lobby, shown above, help ensure that the ghost of Eloise, the fictional little rich girl who pranced about the hotel and whose portrait now hangs in the south corridor off the Palm Court hasn't lost her sense of humor and flair for the outrageous, a trait not lost on former owner, Donald Trump, who got city approval to create penthouse suites on an already tampered-with roof line. Trump subsequently encountered financial difficulties and had to sell most of his stake in the hotel that gave the surrounding business district its name. New York without the Plaza, frumpy or pristine, is unthinkable. It is the embodiment of the "Grand Hotel" even if it pales in size to the likes of the Waldorf-Astoria. With its roofline peaks and rounded turrets, high loggias and balconies topping its whitish facade, and the flags of the countries of visiting dignitaries over its Fifth Avenue canopy, the Plaza avers the somber and the sedate, opting for the lively extravagant. Much of the Plaza’s charm derives from its presence on the plaza across 59th Street from Central Park: "It was one of the rare events in New York’s grid, an open space at the corner of Central Park, and for anyone heading up Fifth Avenue, as every tourist was sure to do, it was the introduction to ‘millionaires; row,’" observed Gregory Gilmartin in his superb book, "Shaping the City, New York and the Municipal Art Society," Clarkson Potter, 1995 (See The City Review review of the book). "Olmstead and Vaux [the designers of Central Park] weren’t adept at designing urban spaces, and their plaza was a strange beast: a stand of trees in an oddly shaped traffic island. In the 1890’s [sculptor Karl] Bitter was one of the leading figures in the campaign to block construction of both the Heine monument and the Soldier’s and Sailors’ Memorial in the Plaza. His argument was that the Plaza didn’t need a fountain or a column sitting in its middle, it needed to be defined as an architectural room. In 1899 Bitter published an article on public sculpture in Municipal Affairs, singling out points in the city where monuments seemed necessary, and putting forward his own design for the Plaza. Bitter imagined the Plaza as a forecourt to the park, half embedded in the urban grid, half in greenery. He designed two symmetrical plazas, on either side of Fifty-Ninth Street, each ending in a fountain of shallow basins modeled on those in the Place de la Concorde in Paris. In 1902, the statue of General Sherman by Augustus Saint-Gaudens was installed just off Fifth Avenue, between Fifty-Ninth and Sixtieth Streets. Otherwise, nothing happened until 1911, when Joseph Pulitzer died and left $50,000 for a fountain in the Plaza. In choosing the Plaza, Pulitzer threw done one last challenge to his bitter rival, William Randolph Hearst, who’d just erected the unfortunate Maine Memorial on Columbus Circle . Pulitzer must have seen Bitter's 1899 scheme, since he asked that his fountain resemble those in the Place de la Concorde" in Paris, Gilmartin wrote. Bitter was recommended by a committee, but was against the plan because it did not take into consideration the entire space. Eventually Thomas Hastings, the architect, was commissioned for an overall plan and he selected Bitter to create a sculpture, Abundance, for the fountain. "The day he finished the clay model, Bitter was run over and killed by a car outside the Metropolitan Opera House," Gilmartin recounted. The French Renaissance-style design by Hardenbergh is impressive with its marble base and its very interesting and subtle window reveals. The ground floor picture windows have bronze sills. In the 1990's, the hotel put a large television in the Oak Bar, a modern touch that was unfortunate and hopefully will be removed. Elad's plan called for making 200 condominium apartments in the Plaza, which would be left with about 150 hotel rooms. The plan was opposed by union workers and after a flurry of controversy Elad revised its plans by lowering the number of condominium apartments. 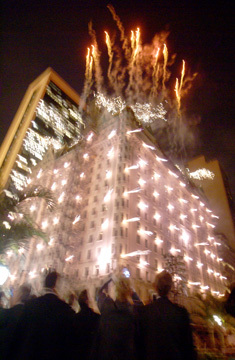 The centennial of the Plaza Hotel was celebrated October 1, 2007 night with a fireworks show launched from the building's roof and many of its windows. A 12-foot-high cake replicating the design of the famous landmark was displayed in the city of the plaza in front of the east entrance to the hotel, whose $400-million-plus renovation was nearing completion. The Orchestra of St. Luke's played on a podium in front of the entrance as images from the hotel's history were displayed on two very large video screens. Ceremonies marking the occasion were scheduled to start at 7:15 PM but did not begin until about 7:45 PM as invited guests moved to the plaza on the northwest corner of 59th Street and Fifth Avenue where they were given splits of Moet & Chandon White Star Champagne, opened with straws inserted whose tops were still enclosed in paper. Shalva Berti sang the theme from "Love Story" and Matthew Broderick, the actor, jibed "Let's Go Mets" before introducing Isaac Tshuva, the founder and chairman of the El-Ad Group, whose Elad Properties subsidiary bought the property three years ago for $675 million from Alwaleed Bin Talal Abdulaziz Alsaud, a Saudi Prince, and Millennium and Copthorne Hotels. 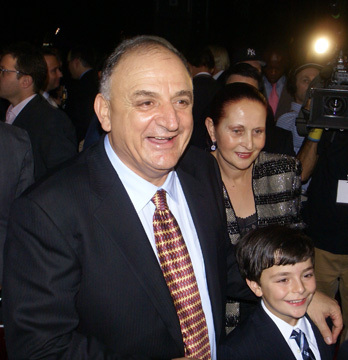 Elad soon sold the hotel portion of the property back to the prince for about $500 million. The renovation of the hotel has created 181 condominium apartments, a 134-room hotel on floors 4 through 10, and 152 hotel-condo units on floors 11 through 21. According to an article in the October 1, 2007 edition of The New York Sun by Bradley Hope "just 12 of the luxury condos have yet to be purchased…, and a third of the hotel-condos are gone," adding that with…luxury condos selling at a minimum of $5,000 a square foot, Elad is poised to rake in nearly $2.4 billion in residential sales." Mr. Tshuva said that the hotel portion of the renovation project will open December 12, 2007, and the remainder of the project "shortly thereafter…more magnificent than ever." 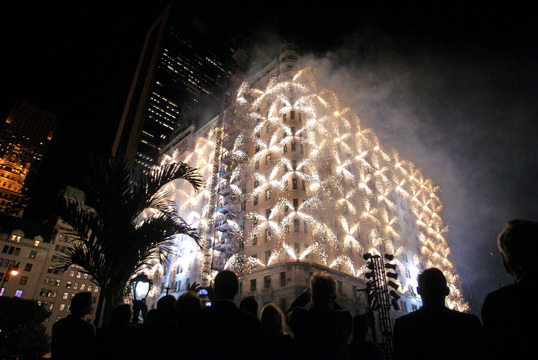 Other speakers included Peter Ward, the president of the New York Hotel Trades Council, who was married at the Plaza 24 years ago, Gal Nauer, Mr. Tschuva's lissome daughter, who was the interior architect who worked on the renovation, and Deputy Mayor Daniel Doctoroff. 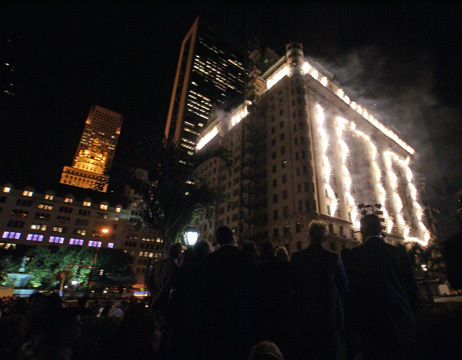 North facade emblazoned with fireworks enunciating "100"
The fireworks display initially displayed "100" on the middle of the building's façade facing Central Park, which elicited a lot of "oohs" from the crowd. It then escalated and went around the building to include its east façade and went through a series of spectacular bursts that seemed to emanate from inside windows and all over the facades, eliciting loud "wows" from the crowd, which included Martha Stewart, Robert Tierney, the chairman of the city's Landmarks Preservation Commission, and Ward Morehouse III, the author of a book on the famed hotel. Paul Anka then serenaded Mr. Tshuva with "My Way," a song he wrote for Frank Sinatra but had rewritten for the occasion, referring to living for "a mere $50 million bucks." Mr. Tshuva, looked ebullient, chimed in on a refrain at Mr. Anka's prompting. The Plaza Hotel was designed by Henry J. Hardenbergh, the architect who designed the Dakota apartment building at 1 West 72nd Street, and opened in 1907. In 1921, Warren & Wetmore designed an expansion on 58th Street. The hotel's exterior was designated a city landmark in the 1960s and eight of its public rooms were declared interior landmarks in 2004. The highlights of the Elad renovation were to be the replacement of the ceiling of the Palm Court with a replica of its original glass skylight and the creation of a landscaped courtyard in the hotel's main central light well. The hotel portion of the project reopened at the end of February, 2008 and the Palm Court a week or so later. In a March, 2006 article in The New York Sun, Francis Morrone noted that the hotel's "restored and new public interiors....are an unqualified success," adding that " Right now, for the first time in the living memory of most New Yorkers, we can appreciate the Palm Court restored to more or less the way Henry J. Hardenbergh, the architect behind the French Renaissance-style building and its interiors, designed it back in the early part of the 20th century. The Fifth Avenue lobby, which has also reopened, dates from 1919–21, when additions and renovations were made to the hotel by Warren & Wetmore, one of New York's greatest architectural firms. A brand new public space, combining a new check-in lobby as well as the spacious Champagne Bar, rounds out the currently accessible spaces. Entered from Grand Army Plaza, the Warren & Wetmore lobby is both familiar and unfamiliar. Its true palette has been restored, whiter and creamier than one remembers. It's an outstanding example of Gatsby-era classicism, a light-as-a-feather style — Elsie de Wolfe worked in the same vein — employing cream, beige, large mirrors, French windows, crystal, terrazzo, and simple, stylized floral motifs in moldings and iron railings. Though the era hardly shied from gilt, there's no Gilded Age encrustation. Just a free-floating feeling that goes with drinking one martini too many and taking a dip in the Pulitzer Fountain. Before the Plaza closed for renovations in 2005, I'd never really gotten that out of this space before. Now it's the keynote....Just as we now see the Plaza's Fifth Avenue lobby more clearly than before, so do we now more clearly see how Warren & Wetmore took their cues from Hardenbergh, whose Palm Court lies directly west of the lobby. I'd always found the Palm Court uninspiring. Now I find it breathtaking. Its large mirrors, palm trees, marble columns and pilasters with gilded capitals, gilded grillwork, and crystal all evoke much the same feeling as the Fifth Avenue lobby. Two things stand out. First, a set of four caryatids - columns or piers bearing the human form along the far wall, the work of the Gilded Age decorators Pottier & Stymus, are all the lovelier for the way the room overall is loftier and freer in feeling than what we think of as a Gilded Age interior. Second, there's the skylight! This was a part of Hardenbergh's original design, but it was removed during the Conrad Hilton years (1943–53). It's been restored via a painstaking process, mainly involving replicating what can be seen in old photos. And it's wonderful: a simple, geometric design that serves further to lend sparkle to the space. We're a few months away from the reopening of the fabled Oak Room and Oak Bar, and the Edwardian Room. The old 59th Street check-in lobby, though a designated landmark interior, is now part of the condominium portion of the building, and is off-limits to the public. Hardenbergh designed the Oak Room, the Edwardian Room, and the 59th Street lobby; Schultze & Weaver designed the Grand Ballroom, reopened in January, and Frederick P. Platt & Brother (or so New York's Landmarks Preservation Commission surmises) designed the Oak Bar in the 1940s." An article in Crain's New York in October, 2008 by Lisa Fickenscher, however, noted that the high-back chairs in the Palm Court have been replaced by ones with lower backs. Elad has planned a $5 billion complex in Las Vegas to be known as Plaza Las Vegas. A December 17, 2008 article by Steve Cuozzo in The New York Post noted that a refurbishing of the baronial Oak Room restaurant had "stripped away generations worth of grime and veneer that had blackened the oak walls and ceilings" and that "the lobby space is as baronial as ever, but refreshingly lighter on the eyes." "Our next shock was the food. On my earlier visit, a cut of olive oil-poached halibut only slightly larger than an American Express card had been an oily, $38 mess. The kitchen's gotten shaper since then. Tuna tartar -- more accurately cubed chunks - sparkled on the plate and on the palate....'The Plaza has been getting terrible press,' said the Oak Room's owner, Joey Allaham, plopping himself down at our table. The man can definitely read. Vanity Fair reports that women wept in despair on entering the condo-apartment lemons their oligarch husbands had bought sight-unseen. The Times picked apart the 'Retail Collection,' which closely resembles a Green Stamps redemption outlet....with the Oak Room acting like a real restaurant for the first time in its history, I hope people will come." An article by Steve Cuozzo in the March 24, 2010 edition of The New York Post noted that "The Plaza Hotel's fabled Palm Court will reopen on April 12 after standing embarrassingly dark for 15 months," adding that "The noble noshing space framed by marble pillars, lofty mirrors and a stained-glass skylight will have new furniture (no more silly 'throne' chairs) and lighting that will actually make it possible to see it all. " The article said that "Best of all, afternoon tea will start at $45, compared to $65 previously. " "Nose-in-the-air types considered the landmarked Palm Court touristy and overpriced, but it was one of those places that defined postcard Manhattan, and was inextricably woven into the city's fabric of celebration. Like many "iconic" venues snubbed by locals, but painfully missed when they're gone, it was beloved by new arrivals better able to appreciate it - like Palm Court regular John Lennon, who made New York his adopted home town," Mr. Cuozzo wrote. 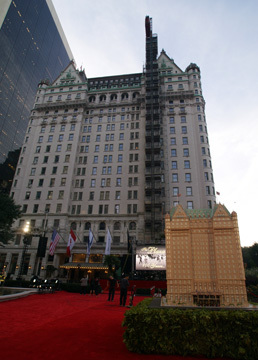 A December 24, 2010 article by Josh Barbanel in The Wall Street Journal noted that "many working New Yorkers dream of living in a hugely expensive condo high up in the Plaza Hotel, down a corridor where Eloise may have once roamed [but] Edwin Pinzon, the superintendent at the Plaza, gets to live that dream every day. As one of the perks of his job, he gets to live in a large one-bedroom apartment on the 13th floor." "When much of the Fifth Avenue hotel was converted to a condominium in 2007, the condominium buyers were obligated to provide funds to purchase the superintendant's apartment from the converter, El-Ad Properties. Now, property records show that the Plaza condo board has completed the purchase, paying $3.1 million for the unit. That price that may be the most expensive superintendent's apartment ever purchased by co-op or condo board, brokers said. While many older buildings provide their supers with plain units on lower floors or even the basement, Mr. Pinzon's apartment, with two bathrooms, a dining-room alcove, and 1,279 square feet of space, costs $2,428 a square foot. Similar apartments have been listed at rents topping $16,000 a month." "Developers," the article continued, "say that they need to provide a quality living space to attract top people to run their very expensive buildings. The Plaza's apartment is more expensive than the superintendent's apartment at its neighbor and sometimes rival down the street, 15 Central Park West. That development set a record this week for the highest price per square foot paid for a Manhattan condominium. For the superintendent at 15 Central Park West, the condominium board paid $2.13 million, or $1,632 a square foot, for a three-bedroom apartment last year, according to Arthur Zeckendorf, who developed the building along with his brother, William Lie Zeckendorf. He said the resident manager at 15 Central Park West, recruited from the Time Warner Center, runs a staff of 70, adding that the apartment was a lure in the recruiting."